This episode: A cancer-killing virus could help increase success of treatment of a form of eye cancer in children! This episode: Mouse gut microbes, from mice or from human donors, can protect mice against arsenic toxicity! 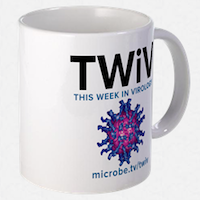 This episode: Phages eavesdrop on bacterial communications to attack at the perfect moment! This episode: Enhancing a virus with magnetic nanoparticles and CRISPR-Cas gene editing abilities makes it a good vector for genetic therapies! This episode: Combining cells with light-absorbing nanomaterials can help tumor-targeting bacteria produce more anticancer compound! This episode: The bacterial immune system, CRISPR-Cas, can enhance gene transfer via transduction (phages carrying bacteria DNA) despite preventing it via conjugation! This episode: Some bacteria that can cause pneumonia can prevent other bacteria from doing the same!